Meghan Markle has been heavily criticized by the media as "difficult" and "demanding," and Oprah Winfrey has had enough. After announcing her new partnership with Prince Harry, the 65-year-old media mogul came to the duchess's defense during her stop on CBS This Morning on Wednesday. 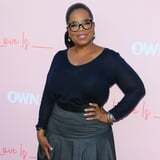 "I think she's being portrayed unfairly," Oprah explained. "She is not only everything that we perceive of her in being graceful and dynamic in holding that position, but she just has a wonderful, warm, giving, loving heart." Oprah then revealed whether Meghan has read any of the negative press about her, and Gayle King also jumped in to defend the royal once again.